A kitchen remodel is like giving the home a breath of fresh air. Yes, the kitchen is only one room in the home, but it is one of the most important. The kitchen is where the day gets started and where the family congregates when the day is done. The kitchen is, quite simply, the heart of the home. That is why giving the kitchen a makeover is like giving the whole home a makeover. A renovated kitchen is satisfying in and of itself, but it also has the effect of raising the value of the home, should the owner wish to sell it in the future. This can make the kitchen remodel rewarding on a personal, as well as a, financial level. That is why a kitchen remodel in Woodland Hills, or anywhere else in California, is a great idea regardless of the reason behind it. A kitchen renovation can be stressful but with the proper planning and preparation, a lot of the worry can be mitigated. The budget is of course, a large part of said planning and preparation, so any remodel plans should start there. The decision of how much money you wish to spend on the remodel project determines the kind of work that can be done on the kitchen. The budget does not have to be huge to make significant changes because there are cost effective variants for nearly every element of the kitchen, from the floor to the counter to the cabinets. A limited budget does not mean that big changes are out of reach. One way to reduce any possible stress is to allocate an emergency fund in your remodel budget. That fund can be 10% to 20% of the budget, and it is there to cover any unwelcome surprises like outdated wiring; if there are no unexpected surprises, then you can either put the emergency fund into your savings or use it to splurge on a new item for your new kitchen. Create a list of the main goals of your redesign, such as, better appliances, more storage, or better lighting. Make sure to organize this list with the most important items first and the indulgent items last. Make a folder of aspirational items from sites like Pinterest or Houzz. This can help to give the planner a better idea of what you want in your new kitchen, and help them to suggest budget-friendly alternatives. Consider how the kitchen will be used. Do you have a big family that spends a lot of time in the kitchen? Are you an avid cook who uses high-end equipment? Do you use the kitchen mostly for entertaining? Once you have made that decision, it will be easier to choose the overall design and function of the renovated kitchen. For example, high-tech appliances for the home chefs, and easy to clean surfaces for the busy families. Make sure the kitchen triangle is as efficient as possible. This is the space between the stove, fridge, and sink; think about how you use the kitchen so that the triangle works for you. Think about where you can cut costs. Instead of using a purely granite countertop, use granite on the areas with the most visibility and use more affordable materials elsewhere. A kitchen remodel can be a novel way to add new life to the home without having to redo the entire house. It also does not have to be expensive, as there are cost-effective solutions to most elements of the kitchen. Amerbuild has award-winning designers willing to help homeowners realize their dream kitchen. They will help anyone regardless of their vision since we provide a variety of materials that will work in a variety of kitchens. We have experiencing helping residents with their Kitchen Remodel in Woodland Hills and surrounding areas. 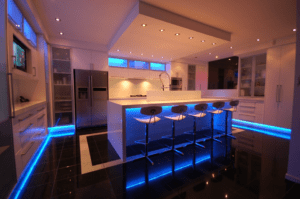 So, when you have decided that it is time to upgrade your kitchen, contact us for the expert design and construction services you need for your big project.